This week True North Perspective has published three Special Editions to highlight comment on significant developments that affect us all. This is the third Special Edition. Today, Thursday, July 24, 2008, our final Special Edition of the week features a review of a new book entitled My Life (Scribner $40) that provides a unique look at Fidel Castro the man and of the development of modern Cuba from the inside out. The book is distilled from more than a hundred hours of conversations with Le Monde diplomatique editor Ignacio Ramonet, There can be no doubt that Fidel, as he’s popularly known at home and abroad, has transformed the economics and politics of especially Central and South America and in so doing is having a growing impact on these developments in North America — 461 words. 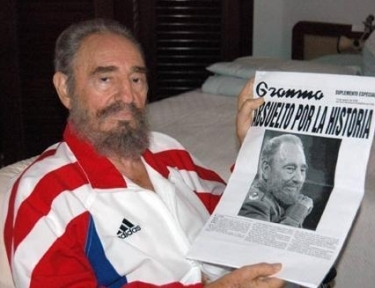 'In a final summation, Castro lists his country's accomplishments in education and healthcare, advances in science and medicine, contribution to decolonization and rolling back white supremacy in Africa, ongoing humanitarian internationalism and the audacity of having survived "thousands of acts of sabotage and terrorist attacks organized by the government of the United States. ...”What," he asks, "is Cuba blamed for?" One of Fidel Castro's earliest political memories is of Spaniards arguing over the Spanish Civil War, and his first act of censorship, he explains in My Life (Scribner, $40), was done in kindness. When asked by his family's illiterate cook — a "fire-breathing Republican" — for news of the war, the nine-year old read him stories that played up loyalist success because he wanted to make him "feel better." Castro's Galician father was a franquista, as were his Jesuit teachers, who prayed for Spain's martyred priests while offering not a word for "the Republicans who were being shot by firing squads." A recent study of Castro's grade school years has him an admirer of fascism, and in My Life, distilled from over a hundred hours of conversations with Le Monde diplomatique editor Ignacio Ramonet, Castro does mention that he collected trading cards commemorating Mussolini's 1935 invasion of Ethiopia. "I became almost an expert on that war in Abyssinia," he says. But Castro remembers this as his first object lesson on modern consumerism: his friends would compete to collect a complete set of cards but "some of them would deliberately never be printed, to make kids buy them, you know. Capitalism." — 4,744 words. Which came first, the Robertson screw or the Phillips screw? The Robertson screw, developed by Peter Lymburner Robertson of Milton, Ont., in 1908. Phillips’ screws didn’t come onto the marketplace until the 1930s, the brainchild of Henry F. Phillips, a businessman from Portland, Oregon.